When you’re out camping, you shouldn’t just worry about you having a good time. With all the things people have done to ruin our planet, it’s up to us to try and remedy our mistakes by using natural, eco-friendly products. And since you’ll surely need cleaning items on your camping trip, it’s wise to choose the best biodegradable soap that’s safe to use outdoors. That will limit the time and products you bring along, seeing as you won’t need anything else to respect the safety rules and regulations in place at your camping site. You just have to be careful about how you choose your soap and also browse a few product reviews before choosing what you need. See our tip on what should be on your camping checklist to have an enjoyable trip. Natural and organic. Look at the lists of ingredients to ascertain that there are no synthetic detergents, or genetically modified organisms used to manufacture the soap. Check for natural oils and botanical ingredients, and make sure there isn’t any phosphorus or triclosan used, that are quite vicious pollutants. Environmentally safe. There are some non-natural ingredients that are still considered safe for the environment, seeing as they aren’t toxic chemicals. So just make sure the soap has all the necessary FDA approvals to ascertain it’s biodegradable. Animal-friendly. An eco-friendly soap isn’t just biodegradable, but it keeps animal testing and animal by-products to a minimum. So green is also equal to taking into account animal rights, though that doesn’t necessarily make a soap biodegradable. It should remove dirt, grease stains, and even bug sprays. Travel-friendly. You should easily pack it and use it for multiple purposes, like washing your body, dishes, and gear in different types of water and regardless of the water temperature. Subtly fragranced. 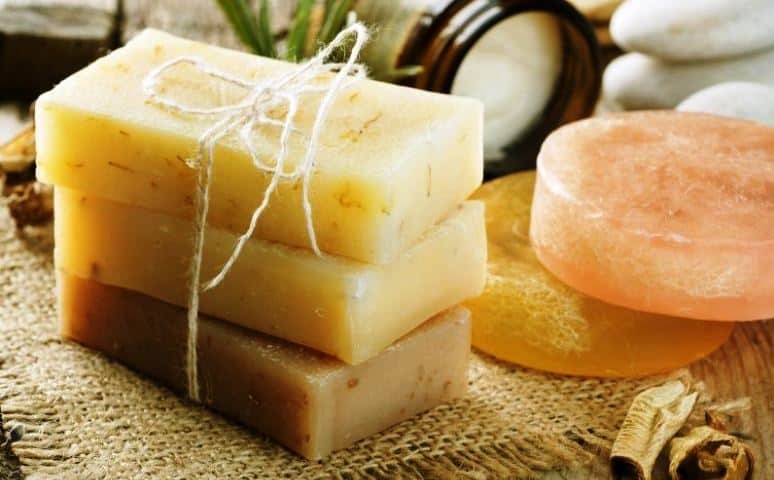 Some people may enjoy a potent odor for their shampoos and soaps, but most biodegradable soaps have subtle or altogether inexistent aromas, since they’re made from natural ingredients and don’t have any added perfumes Plus, you don’t want your dishes smelling too strong, do you? After taking these factors into account, there are quite a few impressive camping soaps to consider, You’ll find that they all have different characteristics, but the most important thing is that they’re doing their job and it’s up to you to select a good product according to your needs. 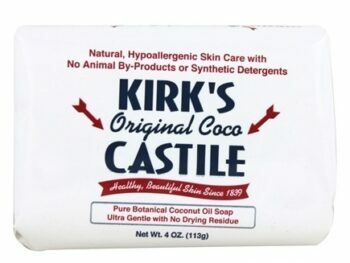 This Kirk’s Castile Soap comes in a 3 ct. package. That’s amazing for the listed price, considering that it’s entirely a vegetal soap, meaning it has no trace of animal-related products, and it was never tested on animals during its manufacturing. Being a purely botanical soap entails a lot of benefits for your skin, apart from being a cruelty-free product. Since it’s made from coconut oil, you can rest assured you’ll get a good soap for your skin and hair, should you use it as a shampoo. Coconut oil is very gentle and leaves your skin feeling soft. Conversely, you’ll feel the bar’s a bit oily when you first grab hold of it, but once you use it, you’ll get that squeaky clean feeling. The reason is that this soap bar has a basic pH of about 10, so it may even dry out your skin if you have such issues. On the other hand, it’s great to use for people with oily skin, and it doesn’t have a powerful smell to annoy you. Or, you even have the convenient option of turning it into a laundry detergent that’s biodegradable and natural. 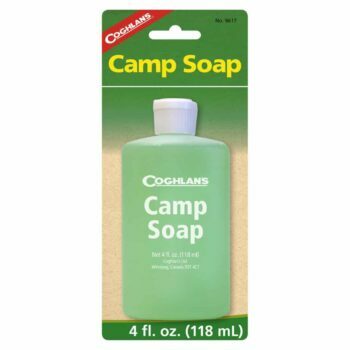 The Coghlans Camp Soap is great for camping because it’s a very versatile product. Firstly, you can use it to wash whatever you need around the camp, beginning with dirty dishes, clothes, and even yourself. Since it’s a mild enough soap, you can confidingly use it to wash your skin and hair, without making it feel dry. Secondly, it’s great for outdoors because you can even use it with cold water and that’s always a plus if it’s too much of a hassle to warm it. Considering that it dissolves grease perfectly no matter the temperature or type of water you’re using, you can infer it’s a powerful soap. Apart from this, you won’t pollute the environment in any way because it’s a biodegradable product. Plus, it’s the perfect addition to your backpack considering its small dimensions and low weight. At just 4 ounces, you may ask yourself if that’s enough to do the job in a few days’ camping trip, but it’s a pretty concentrated solution so the answer is yes. 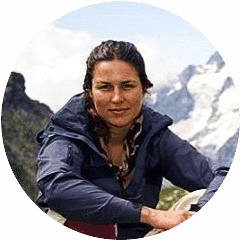 The Sea To Summit Pocket Soap is great when you’re camping or hiking and want to pack light and thus grab only the strictly necessary items. This is an eco-friendly soap that doesn’t use any phosphates or parabens in its manufacturing, therefore ensuring you won’t pollute the environment. 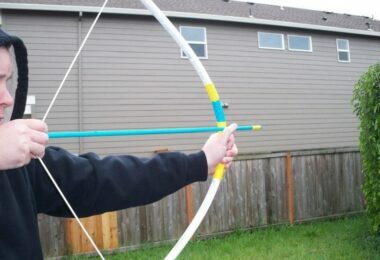 Even more, it’s biodegradable, so you won’t need additional cleaning tools when using it outdoors. We love its subtle odor that resembles green tea, and also the fact that it’s great for traveling purposes. 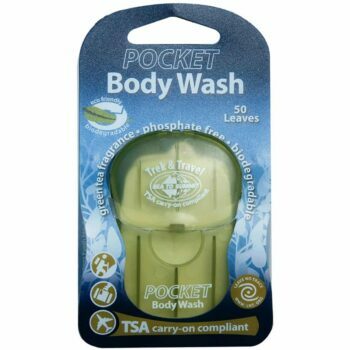 It’s TSA carry-on approved and there are 50 leaves in every pack. These are all dry soap, so you won’t have any leakages to ruin your things. Furthermore, you’ll be able to pass security in all airports, and you won’t have any trouble rationing it, considering you’ll need about 4 leaves for every shower. This lightweight, compact soap has to be used only with dry hands. Some people find it awkward to get the soap leaves with dry hands, and keeping them dry while wetting their hair for instance. However, other internet reviewers share their secrets, like using small ziplock bags for the soap leaves and then mixing them with water to use later. 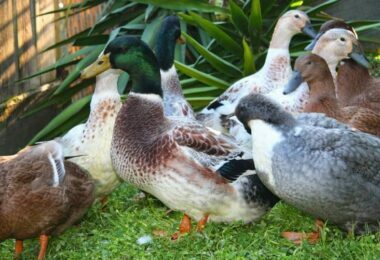 But you have to make sure they’re completely dissolved because otherwise, you can find undissolved soap in your hair. Apart from these mishaps, if you use them properly, the soap leaves will rinse out easily after they remove any sort of dirt stain or even bug spray. This 4.1 stars soap is great for hiking, camping or even for indoor use. That’s because it’s a highly versatile item, which can be used regardless of the situation or the things you want to get clean. 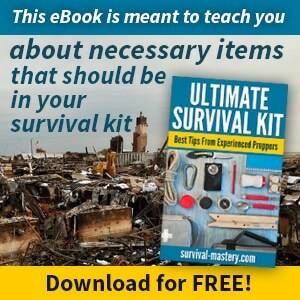 You can use it on your body, on your camping gear and even on your clothes, so you won’t have to pack a lot of different stuff that you might forget. 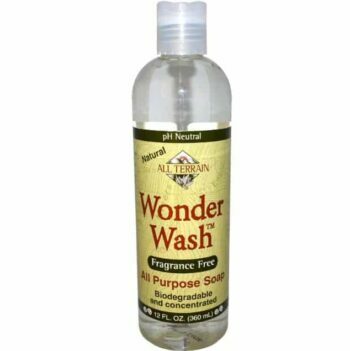 Apart from this, the All Terrain Wonder Wash Soap is a biodegradable product that won’t mess with the environment, keeping it all eco-friendly. The ingredients used for manufacturing it are all natural, and they contribute to the neutral pH of this soap. That means it will be very gentle on your body and gear, not drying your skin or ruining your delicates, and you can use it on your hair without any hesitation. 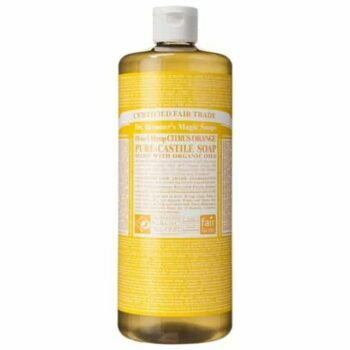 Although it’s a mild soap, it’s a liquid, concentrated solution that will minutely clean everything. Its cleansing power is quite remarkable and you’ll need just a few drops to get squeaky clean when showering or even when you’re removing greasy dishes. The only downside is that the bottle may leak since it’s a liquid soap, but as one funny reviewer puts it, at least you won’t need any additional soap when cleaning your car trunk. At 4.6 stars Dr. Bronner’s Liquid Soap comes in Citrus, but you have seven other different options to choose from if you’re not happy with this one. They all smell natural and are extremely gentle on your skin while protecting the environment thanks to its natural, organic and vegan ingredients used. So since there are no synthetic detergents used, and absolutely no preservatives or genetically modified organisms, everything’s certified organic courtesy of the USDA, while the Vegan Action classifies this soap as entirely vegan. Even the packaging is eco-friendly since it’s made only from recycled plastic bottles. As such, you’ll get a mix of citrus that will clean, protect and invigorate your body. Since it uses oils made from oranges, lemon, and lime, you can rest assured you won’t just get cleaner after showering, but you’ll also feel refreshed and relaxed. Apart from these ingredients, there’s also the effect of the pure-Castile soap to consider, that accounts for a soft, rich and moisturizing lather. That will make your skin feel soft and smooth while helping you enjoy your showering experience even outdoors. Besides, you can use it otherwise too, like for washing dishes, mopping the floors or even doing laundry. The Outdoor RX Cam Soap is made from natural ingredients, that render it biodegradable so you won’t need extra stuff to ensure you don’t pollute the environment. Since it has biodegradable characteristics, it’s also a lather-free soap so it won’t get really bubbly to enrich your showering experience. On the other hand, it does its job and helps you keep your body and gear clean thanks to its concentrated formula that has a surprising cleaning power. 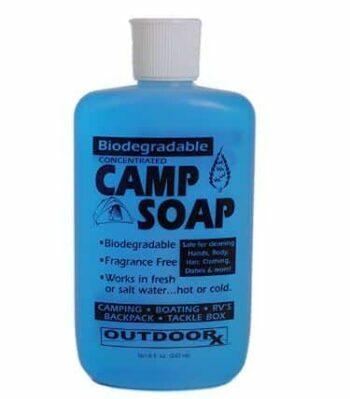 Moreover, it doesn’t have any kind of odor, and that’s always a plus when you’re out camping and using this soap on your dishes. Speaking of dishes, you can use this soap on them, apart from washing different parts of your body, clothes and even hair. Outdoor RX states you can use this product no matter how low the water temperature gets, and that it even works in salt water, which most internet reviewers agree to. The thing that makes this Camping Soap and Shampoo Bar so great is it’s travel-friendly too since it has a travel case made from thick plastic. That ensures the soap remains safely inside thanks to its locking lid, and it won’t ruin the other stuff in your backpack. Besides, this case is waterproof so the soap won’t get ruined in case you get stuck in a rainfall or drop it into a puddle of water. 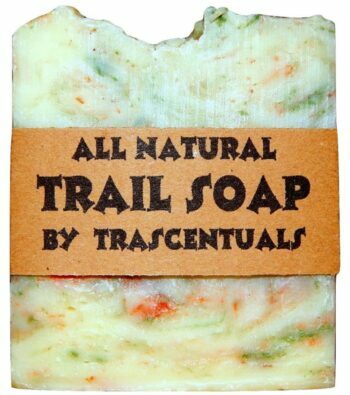 Since it comes in the form of a bar, this trail soap is great because it prevents any sort of spillings that might occur with liquid soap. And even if it’s a bar, it can still be used safely on your hair as a shampoo. So the good news is it’s versatile enough, you won’t need any other products for your other bathing needs. We also love the “forest floor” fragrance of this soap that’s entirely natural since it’s only courtesy of the natural oils used as ingredients. You won’t get any chemicals or perfumes with this soap that literally smells like the woods you’re probably hiking in. The grade oils used for its manufacturing, like grapeseed, palm, hemp oil and cocoa butter contribute to the feeling of cleanliness and soft skin. The reason is that these are ingredients that don’t mess with the natural oils people have on their skin, so this soap protects both you and the environment, and it decomposes on its own with time. Plus, if you want a further insurance of the quality of this soap, consider the manufacturing process too. As it’s a handmade product, you can rest assured the soap bars are individually mixed, cut and packaged without any machine processing that can bring occasional damage to bulk products. 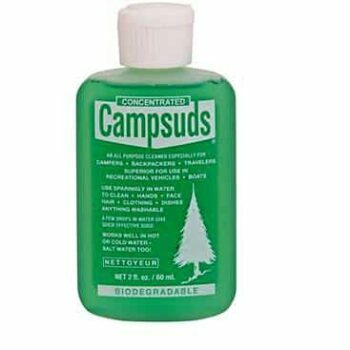 This Campsuds soap is another great cleaning product for camping and other outdoor activities. The main reason is that it doesn’t pollute the environment, considering it’s a biodegradable soap. Apart from being a safe soap, it’s also a soap that works on different things. You can use it to wash your hands or take a quick shower once you’ve set camp. But it’s also great to use on your equipment, dishes, utensils and clothes. It’s a mild enough soap, so you won’t have to worry about it ruining your stuff or your skin. The reason is that it’s made with natural ingredients, that are all derived from vegetals. So there are absolutely no traces of animal by-products used, and even its fragrance keeps this natural line, thanks to the essential oils used. All these characteristics render this particular soap mild and soft for personal hygiene, it has a considerable cleaning power. Therefore it will clean stains, grease, and even traces of insect repellent. 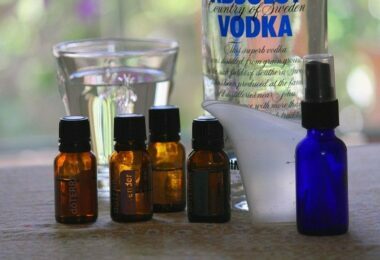 See also our article on DIY natural mosquito repellents to keep you safe. Another reason why it’s a necessary addition to your backpack is the fact that it can work no matter how cold or hot the water gets. Apart from sweet water, you can even use salt water with this soap, and salt won’t get stuck in your hair. Plus, the water doesn’t have to be soft, it works perfectly well with hard water too, still giving you a gentle scrub. Plus, since it has reduced dimensions, this soap makes for a convenient addition too. Don’t worry that since it only has 6.4 ounces, the soap bottle won’t be enough for your trip – it’s actually so strong that it only needs a few drops to work. The only disadvantage is the liquid form that can cause leaks, but pack it securely, and that won’t matter anymore. After reviewing all these products, we’re sure you must have found a good soap for your next outdoor adventure. Let us know what you ended up picking, and if that soap worked for you. In fact, tell us everything: what you used it on, where you went, how many days you stayed for and if it was enough. Plus, if there are any other advice, tips or tricks you want to share with our other readers, feel free to do so. The comment section awaits even if you want to bash a certain highly-praised soap that totally failed you. Before you leave on your next trip, check out our guide on what to bring on your camping trip to make it enjoyable.